I have spoken before that I am a fan of the Dollar Cost Averaging (DCA) method for investing in stocks. Particularly as a way to invest a regular stream of income. 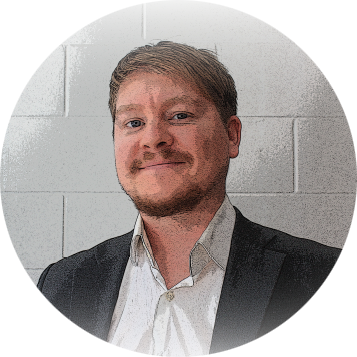 In this article I present a new take on the traditional DCA approach and suggest a way investors can further improve their returns. I also suggest that it is possible to buy random stocks and still make good returns over time. Dollar Cost Averaging simply means investing a fixed amount of money in the market at regular intervals and this is typically done with an index or tracker fund, since an index will never go to zero and will likely trend upwards over time. One simple example of this is to invest $500 in the S&P 500 index every month. The advantages of the DCA method are well known. Namely, DCA eliminates the need to time the market. Since trades are made every month using a fixed amount of capital, more shares will be bought when the market is low and fewer shares will be bought when the market is high. This smooths returns and improves investor discipline. Studies also show that DCA to be a worthwhile way to make regular investments in shares and this is why most pension and 401K policies are based on this approach. It has been well discussed that over the long term, lump sum investing achieves slightly higher returns than the DCA approach. With lump sum investing, capital is employed into the market at the earliest opportunity and it therefore benefits sooner from the long term upward trajectory of stock prices. However, the majority of investors do not have large lump sums available for them to invest, and many investors would benefit more from a strategy that allows them to systematically invest a portion of their salary. 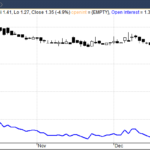 DCA is that strategy since it allows investors to buy more shares during market troughs than at market peaks. In the 2012 paper, ‘Building a Better Mousetrap: Enhanced Dollar Cost Averaging’, Friesen and Dunham present a simple, rules-based strategy that seeks to improve on the typical DCA approach. Friesen and Dunham suggest that DCA can be improved upon by systematically investing more when the market has experienced negative returns and investing less when the market has undergone positive performance. (Although there is a little more to it than that, that’s the basic premise). Naturally this got me thinking as to whether there are any more ways to improve upon the DCA method. 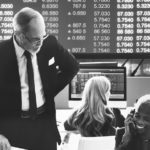 Can we improve returns by investing in individual stocks, instead of the index? If so, which stocks shall we choose? Or, does it even matter which ones we choose? To further investigate these questions I loaded up historical data for the SPY ticker symbol (representative of the S&P 500 index). I then calculated the compounded annual return using a DCA method from January 1994 – January 2014. Commissions were set at $10 per trade and trades were entered using the open price. NB: In reality, investors should be able to able to find ways to invest in the index without paying commissions of $10. The Vanguard VOO ETF is one that can be bought without commission. Buying $1000 worth of shares in the index every month over the last 20 years resulted in a total net wealth of $555,121, from a total cumulative investment of $240,000. 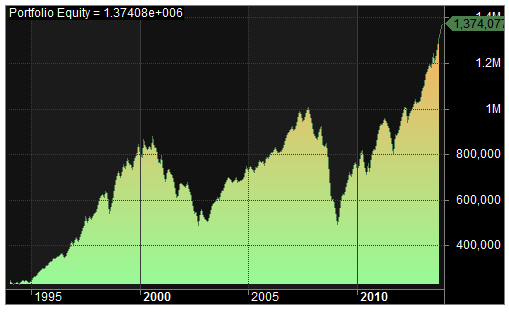 Maximum peak-to-trough drawdown was -43% and Recovery Factor was 1.87. This equates to a compounded annual return of 4.30%. Investing the same amount ($240,000) into SPY at the very beginning of this period (buy and hold) resulted in a much larger total net wealth of $1,374,076. That equates to a compounded annual return of 9.15%. The maximum peak-to-trough drawdown was -51%. 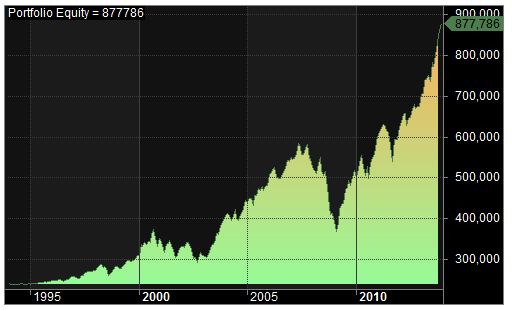 So we can clearly see that the buy and hold approach has outperformed DCA over the last 20 years. However, as I said earlier, the majority of investors do not have this type of lump sum available. Instead, many investors would prefer to know what they can do with the monthly salaries that they receive. 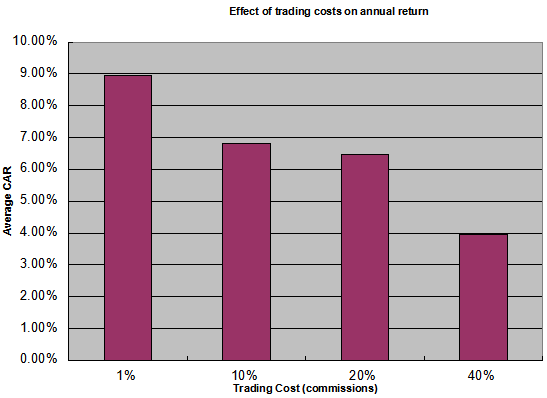 So what if we can improve the DCA approach in order to get closer to the returns realised from buy and hold? I have already mentioned that DCA can be enhanced by investing more when the index has performed badly and investing less when the index has performed well. But what happens if we apply the DCA method to individual stocks instead of the index? In this next test, our trading system buys $1000 of stock (any stock) each month. The test is run on all stocks (including delisted securities) from the S&P 1500 index between January 1994 and January 2014. 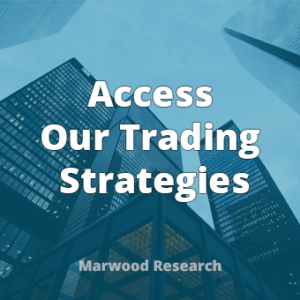 The only additional criteria is that the stock must be priced over $1 and have traded with a reasonable amount of volume (over 100,000 shares) on the day that the trade is made. Commissions are set at $10 per trade and trades are entered using the open price. 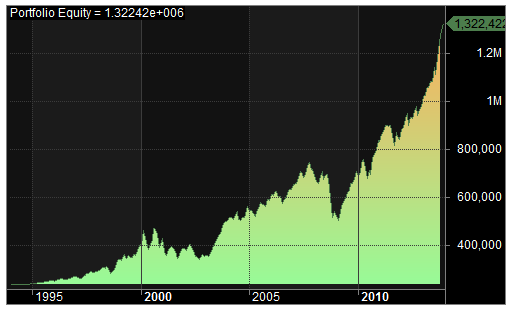 So, can you make money adding random stocks to a portfolio? This test resulted in a total accumulated wealth of $877,786 equating to a compound annual return of 6.72% over the 20 year period. The maximum peak-to-trough drawdown was -37% and the system’s Recovery Factor was 2.96. So in this example, we can see that investing $1000 in one random stock each month outperforms investing $1000 in the S&P 500 index every month. However, since this test buys random stocks it is of course possible that the result is just a one-off random occurrence. To test this, I ran a Monte Carlo analysis over the results, whereby the order of trades (and therefore the combination of trades) was altered many times. 1500 simulations were run and the resultant equity curves were plotted against one another. As you can see, the best performing simulation out of 1500 runs resulted in a total equity of over $1,000,000 while the worst performing run resulted in a total equity of just over $350,000. The average result was a total equity in the $600,000 to $650,000 range, around 5% CAR. 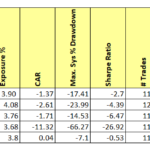 The results of the Monte Carlo indicate that buying a random stock each month is a robust strategy that can be counted on to deliver compound annual returns of around 5% the majority of the time. In 1500 simulations there were no occurrences where the strategy returned less than the total amount invested. The strategy works because companies rarely go bankrupt and most stock prices go up over time. 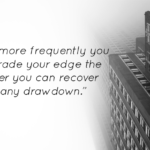 While losses on any one trade are capped at 100%, the possible profits on any one trade are much larger. In this example, around 25% of stocks bought ended in a loss and there were actually 13 stocks that declined by over 90% in value, (most of these never recovered). However, the strategy was saved by numerous big winners. In fact, 15 of the stocks bought went on to make over 1000%. Of course, the 5% average return from this strategy is hardly the stuff that dreams are made of. But, the results of the random stock selection give us confidence because it shows that no matter what stocks we buy each month we will most likely end up making money over time. With that in mind, if we change the rules slightly, so that we don’t simply buy stocks at random, we can surely improve our returns even further. To test this, I ran the same DCA strategy as before. But this time, instead of buying any random stock each month, the system buys the most oversold stock (in the S&P 1500), as measured by the RSI(14) indicator. All other criteria was kept the same as in the previous tests. As you can see, buying the most oversold stock in the index each month (as measured by RSI) resulted in a total net worth of $1,322,422 which equates to a compound annual return of 8.94%. 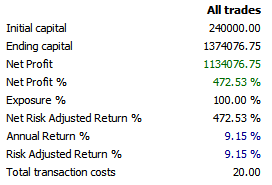 Recovery Factor was 4.50 and the maximum system drawdown was -32%. Running a Monte Carlo analysis on the results shows the best performing simulation returned a total equity of over $2.3 million and the worst simulation returned $500,000. On average, the strategy can be expected to return between $1-$1.1 million over 20 years, a rate of 7.66% a year. The results of the DCA approach when incorporating RSI are good, and the returns are close to what can be achieved through buy and hold. However, there is one issue that needs to be clarified and that is the importance of position size relating to returns. So far, each strategy presented has involved investing $1000 a month with commissions of $10 per trade. This equates to a 1% cost and is generally considered a reasonable amount. However, what if an investor only has $100 a month to invest, not $1000? 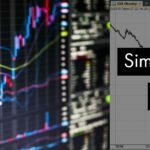 In this scenario, the cost of each trade equates to a much larger 10% of total capital and investors suddenly find it difficult to buy the right amount of shares (since it is not possible to buy in fractional amounts). It’s fairly obvious that this will make the strategy less profitable. Indeed, buying $100 a month of stock with $10 commission sees the annual return of the strategy dwindle to 6.83% over the 20 years – although this is still a better return than from buying the index every month. The effect of increasing commission costs (per percentage of capital) can be seen in the next chart. If we can make money buying random stocks each month, and we can make more money buying stocks that are oversold, it stands to reason that we might be able to improve these returns even further by incorporating fundamentals. For example, there have been various studies to suggest that buying stocks with low PE multiples leads to higher than average investment returns. And incorporating Benjamin Graham style investment screens is also shown to produce strong returns. Unfortunately I have not been able to find the data or platform with which to test this idea out. However, I suspect a strategy like this would provide satisfactory returns to most investors. And it would not be hard to implement. All tests run using Amibroker. Monte Carlo analysis run with Equity Monaco. Stock data from Premium Data. To see the Amibroker code click here. Great concept JB. 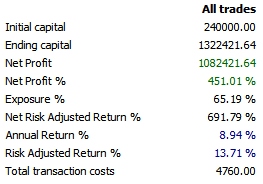 I have duplicated your results (Very nearly anyway) with Amibroker and the Norgate Alpha database. The code check however shows a future leak. Not sure if it really matters in this type of example though since it isn’t trading very often, and I am not a good enough AFL guy to figure out where the leak is. May want to double check though. Cheers! Hi Mike, thanks for the comment! Yes it will show a future leak because the code uses the formula LastValue(). 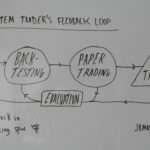 This was necessary to process trades in the right order and it’s not a problem for the system. Looking at the code again, you could use set trade delays = 1, because Volume will not be known until the close. Again, it makes no real difference. Thanks for clarifying JB! I had my suspicions that was the case, but wasn’t sure. No worries Mike. I took a look at your site by the way, love Flight of the Falcon! Great article! What are the results with just buying the index at oversold levels as opposed to individual stocks? Thanks! When applied to the index the results worsen and the reason is because we miss out on scaling in during some very strong bull periods. 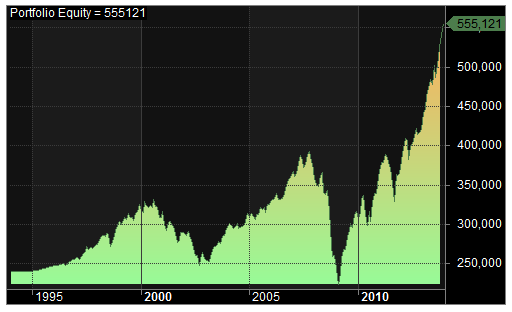 For example, in the late 90’s the market kept going up and up and rarely moved into oversold territory. That said I would like to revisit the article and do some further tests perhaps with RSI(3) and some other indicators.